Six seasons in the National Hockey League afforded Dave Mackey a chance to play in some of the best arenas in the country. But it’s the competition of pond hockey in the last decade that has given him similar satisfaction. “It’s a bunch of good buddies getting together to play. We have a lot of fun,” said Mackey, who played six seasons in the NHL with the Chicago Blackhawks, St. Louis Blues and Minnesota North Stars. Mackey’s pond-hockey teammate, Wade Brookbank, played for four NHL teams in the early to mid-2000s. Mackey, Brookbank and their buddies from Tower Lakes, Ill. – the TL Hawks – will display their skills Saturday, Feb. 9, at the seventh annual Door County Pond Hockey Tournament on Kangaroo Lake in Baileys Harbor. Pool play begins at 8:30 am, with 55 teams playing in six divisions on 16 rinks carved out of the snow atop the lake. The tournament has grown exponentially since its inception in 2013, when five teams competed on three rinks. The DC Pickers stopped the Charlestown Chiefs 7-4 in the title game the inaugural year. And it went. The tournament grew to 15 teams in 2015, increased to 38 in 2017 and added eight more teams in 2018. Mackey said part of the draw to Door County is that it’s an extension of his experience with pond hockey. For the past eight years, he has organized the Tower Lakes Cup, a small tournament of about 10 teams that play three-on-three games on two rinks. His tournament includes a draft and brackets, but it’s limited to residents who live along the lake. Fitzgerald said he sees two important benefits to having such a big event – especially during the winter, when tourism volume is at its lowest. “We can play fun, competitive games, and then hang out with the guys after the game and have a beer,” Fitzgerald said. When: Saturday, Feb. 9. Pool play begins at 8:30 am; championship games begin at 2:30 pm. Facts: Games are four-on-four with no goalies. Goals are made of wood. 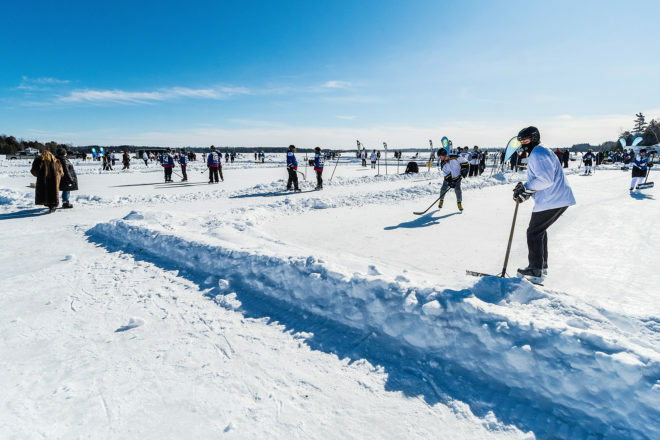 There are 16 rinks created on the ice, with dimensions of approximately 120 feet by 60 feet.After the games: Live music from the Common Ground string band at 7 pm at Door County Brewing Co., and Glas Hamr at 4 pm at Thyme Cuisine, both in Baileys Harbor.